Gamification – SMART-reg International, Inc. Tap into gamification to engage your audience. Our attendee and exhibitor engagement applications are customized, mobile, and enable for easy and seamless integration. Whether it’s assignment of points for participation, or on a scavenger hunt, once points are accumulated, it’s winning time! Attendees can play the game with any mobile device using SMS texting. Either solution will highly increase the BUZZ-factor at your event and both are highly sought-after sponsor opportunities. 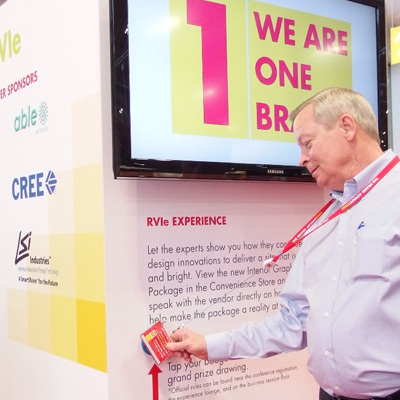 Scavenger hunts encourage traffic in your exhibit hall. Simply divide your floor into sections, provide your participating exhibitors with a unique ID# and promote this game. Once participating attendees visit the number of exhibitors and text the unique code, they are entered into a drawing for whatever prize you see fit. Also highly sponsorable, these Information Towers integrated with our Tap-N-Zooms to use in gamification of your event by having your attendees tap their badge at participating Information Towers and receiving a text or email notification that they’ve won. These can also be used to provide sponsor/speaker literature on-demand. A simple tap of the badge ensures appropriate material is emailed to the attendee.